Grammy Award-winner Vishwa Mohan Bhatt expanded the Hawaiian slide guitar to incorporate nineteen strings, which allows him to combine the techniques of Indian classical music from several traditional instruments, such as the sitar, sarod, and vina. He has performed worldwide, including appearances at the fiftieth anniversary celebration of the United Nations and for the celebration at Lincoln Center of Mahatma Ganhi’s 125th birthday. Subhen Chatterjee has accompanied such masters as Bhimsen Joshi, V. G. Jog, and Rashid Khan. This concert was presented in celebration of the Freer’s “Arts of the Indian Subcontinent and the Himalayas.” Recorded live in the Meyer Auditorium, Freer Gallery of Art, March 28, 2008. Winner of the Grammy Award in 1994, Vishwa Mohan Bhatt is a leading disciple of Ravi Shankar. His instrument, the mohan vina, is an original adaptation of the Hawaiian guitar, featuring fourteen additional strings, enabling him to incorporate playing styles from other Indian instruments such as the sitar, sarod, and vina. He was born into a musical family in Rajasthan in 1952 and began his musical training under his father, who ran a music school. His first original instrument was adapted from a Spanish guitar he found at the school, to which he added drone and sympathetic strings. He currently uses a polished steel rod for the slide and the wire mizrabs of a sitar for the pick. Vishwa Mohan Bhatt began recording in India in 1970 and later toured with Ravi Shankar, appearing on his recording, Inside the Kremlin (1989). He has performed Indian classical music around the world, including concerts in Canada, Great Britain, Germany, Spain, France, Italy, Netherlands, Belgium, Scotland, Switzerland, Denmark, the United States, the Middle East, and the former Soviet Union. He has also collaborated with such Western artists as Taj Mahal, Béla Fleck, and Jerry Douglas, with his greatest fame coming after the Grammy Award for his collaboration with American guitarist Ry Cooder. Their recording, A Meeting by the River, received the Grammy for best world music album in 1994. He subsequently appeared as part of Eric Clapton’s 2004 Crossroads Guitar Festival. In India, he has received some of the country’s highest music awards, including the Sangeet Natak Akademi Award in 1998 and Padma Shri in 2002. Subhen Chatterjee is considered one of the finest tabla players of this generation. He has accompanied such leading soloists as Bhimsen Joshi, Girija Devi, Jasraj, Pt. V. G. Jog, Rashid Khan, Shahid Parvez, Viswa Mohan Bhatt, Ashish Khan, Manilal Nag, and Ali Ahmed Hussain Khan, among others. He bases his style on the Lucknow gharana (school), which he learned from his guru, Swapan Chowdhury. He incorporates other gharana into his performances as well. Subhen Chatterjee has participated frequently in the international WOMAD (World Music and Dance) festival, founded by guitarist Peter Gabriel, where he has collaborated with flutist Paul Horn, David Cosby, and others. Subhen created one of India’s leading fusion bands, Karma, in 1985. His recent collaborations with percussionist Sivamani led to the formation of Friends of Drums, which helps emerging musicians share the stage with more accomplished artists. Music features prominently in Indian art, ranging from religious iconography and depictions of court life to scenes of romantic love and visual representations of musical moods. Several Hindu deities are closely associated with music. The god Shiva is revered as the essence of sound and the deity who brought music to the world. A South Indian bronze sculpture from the tenth century depicts the god Shiva with his left leg raised in a dance posture. In his upper left hand, Shiva holds a damaru (waisted drum) on which he beats the world into existence. In another bronze from the tenth century, Shiva is depicted with his two front hands poised to hold a (now missing) vina, a stringed instrument still played today. The vina almost always appears in the hands of the deity Saraswati, symbolizing her role as the goddess of art and knowledge. Saraswati is depicted to the right of her husband Vishnu in a twelfth-century stone sculpture from the Bengal region and in a thirteenth-century bronze sculpture from Orissa. Depictions of music in Indian art are by no means restricted to religious contexts. Paintings from north Indian courts produced between the sixteenth and nineteenth centuries often depict musical entertainments. A painting made for the Mughal court depicts female musicians serenading princesses in the zenana (women’s section) of a palace. 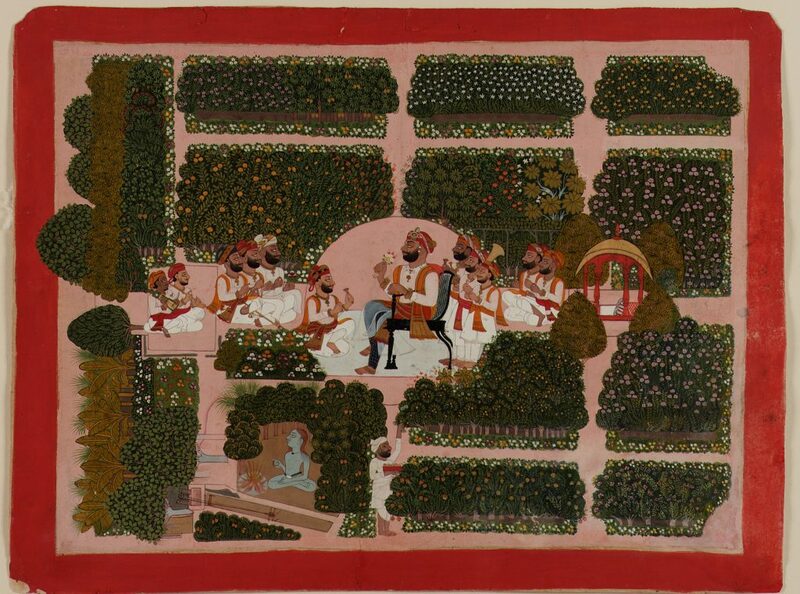 A painting for a Hindu nobleman from the kingdom of Marwar (in northwest India) depicts a musical entertainment, which also takes place in an outdoor setting; the musicians probably are serenading the nobleman with Maand music, a form of semi-classical music from the Marwar region that was patronized by the nobility. use search terms such as vina, raga, Shiva, and Saraswati to find additional objects related to music.